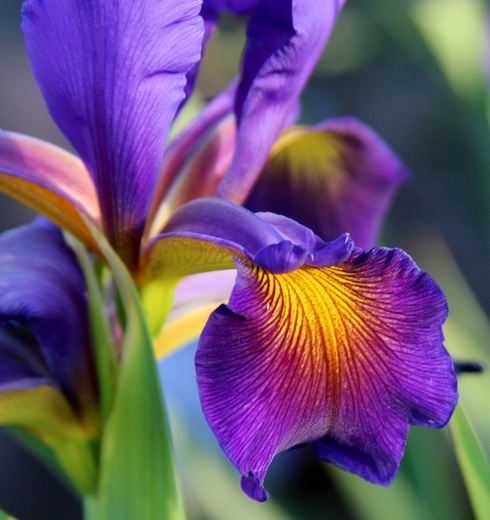 Today, June 30, is the deadline to send in your beautiful photos of irises to the American Iris Society's Photo Contest. It is easy and takes very little time to enter. Just fill out this Entry Form. Email the form and a maximum of five photos (at least 1600x1000 high resolution jpeg) with the category indicated to AISPhotoContest@irises.org. 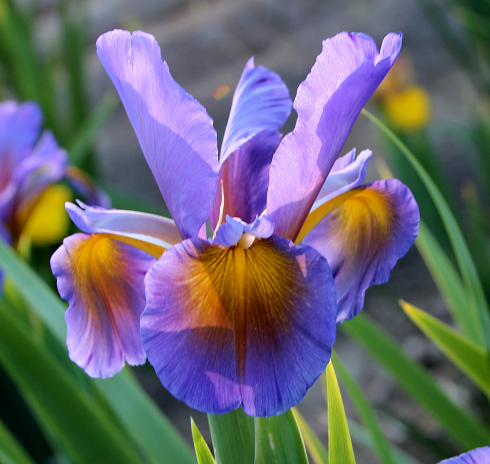 Share your love of irises with others- enter now! Last week I visited ZEBRA IRIS GARDENS. 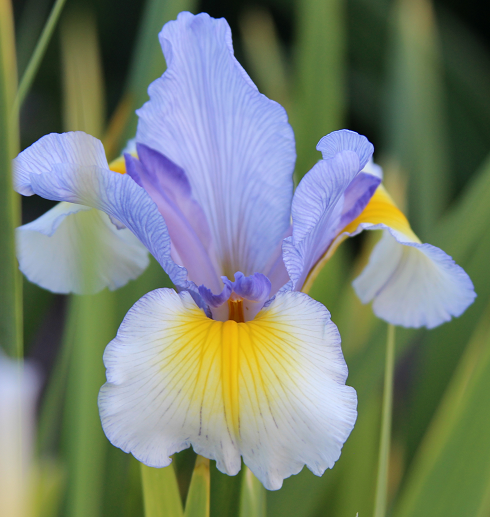 The spuria irises were in bloom, and it was a visual treat! I saw rows and rows of stately spuria clumps. The warm sunlight brought out the beautiful veining on the exquisite iris falls and the garden was a myriad of colors with the lush green foliage showcasing their loveliness; it was extraordinary--ethereal. You might ask, "What exactly is a spuria iris?" 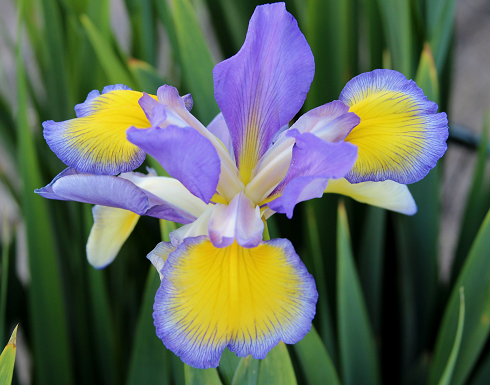 Brad Kasperek's interest in hybridizing spuria irises began in 2005. 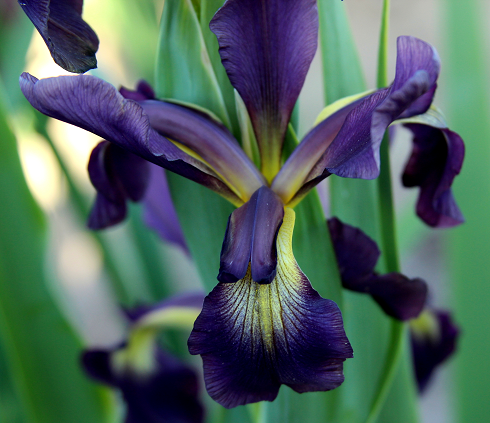 He had often lost much of his bearded seedling bloom to hard April freezes, and had been thinking of switching his hybridizing priority to spuria irises. The president of the Spuria Iris Society cornered him one day and helped convince him it was something he should do. Well, he was right! Brad says he wishes he had started a decade earlier. 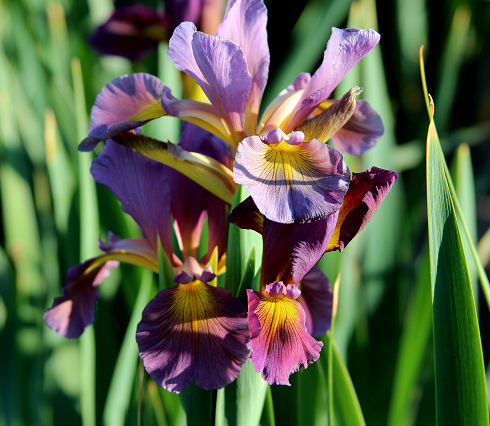 Brad says that "most seasoned iris hybridizers develop an 'intuition' about which two parents to select when pursuing new flower coloration," but that he is too new at spurias to have that ability yet. He said that his "first couple years of seedlings were a great disappointment since their flowers were just like what had already been introduced." After that experience, he said that he chose his "spuria parents more carefully, and this year's seedling bloom from 2008 and 2009 crosses is providing some 'gnu' flower colors and rounder form." Hybridizer Brad Kasperek, Zebra Iris Gardens, with one of his stunning seedlings, pictured below. 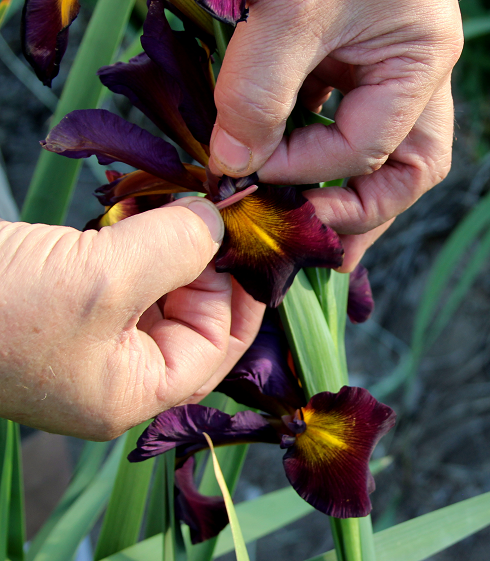 The evening I arrived at ZEBRA IRIS GARDENS I was in luck--Brad was in the process of hybridizing. Brad says he has found the best time for this is between the hours of 7 and 9 pm, when the flowers are more fertile. Watching the painstaking procedure of pollinating, tagging, and recording the data was fascinating. It will be one or two years before Brad sees the fruits of his labors. He says "his current hybridizing goals include a line of non-yellow solid colors and transferring some of Charles Jenkins' and Barry Blyth's color breaks, new colors or patterns, to better plants." He says that he believes that "the best plants are from Dave Niswonger with some from Jenkins and Floyd Wickencamp as well." 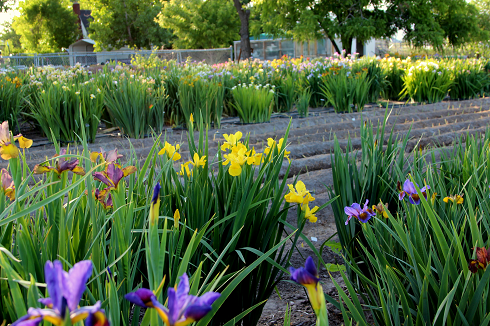 A bed of newly transplanted spuria iris among the established clumps of blooming flowers. This year, Brad has two exceptional spuria introductions and one was in bloom when I visited. 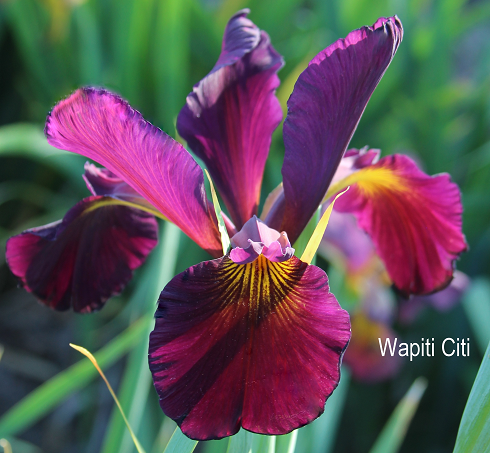 "WAPITI CITI" (SPU 42" EM Kasperek '13), is lightly ruffled, with rich, medium red-purple standards, style arms and fall rims. Matching inverted eyelash veining on a bright yellow signal completes this introduction. It also has 6-8 buds. Regal! An introduction last year, "IBEX IBIS" (Kerr/Kasperek 2012) is a well-proportioned clump. It has 6 budded stalks with a mass of flowers with medium lavender standards and a matching band around sunshine yellow falls. I eagerly look forward to additional introductions from Brad. 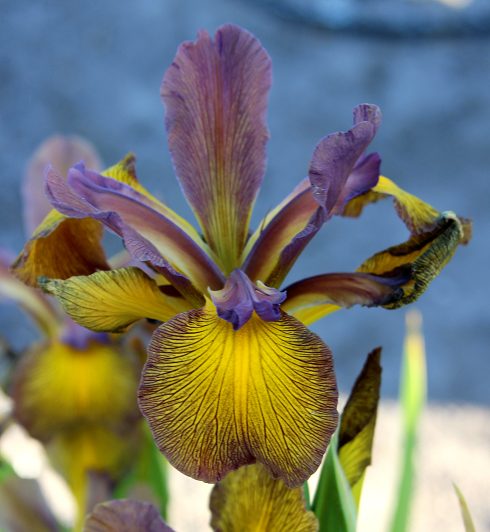 I predict a resurgence of these remarkable flowers in the iris world--the possibilities are exciting! 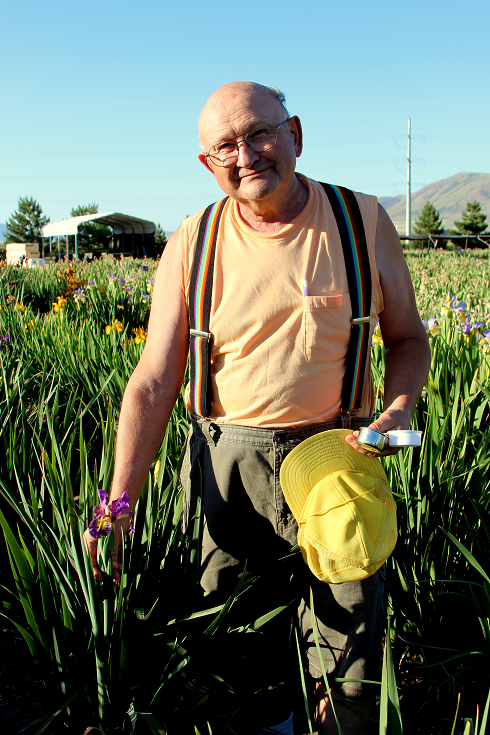 I appreciate Brad's hospitality and thank him for welcoming me to his stunning iris garden. 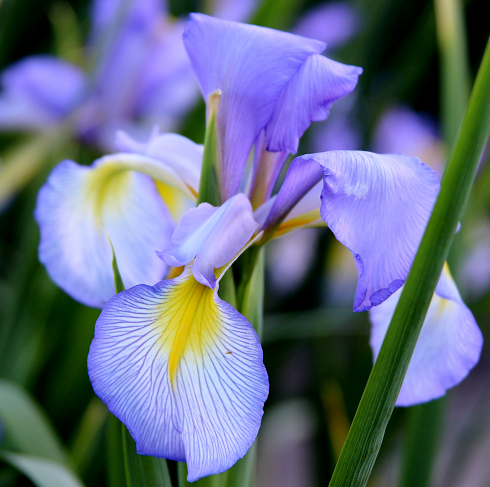 To read more on spuria irises, or to join the Spuria Iris Society, (SIS) a section of the AIS, see them on their facebook page at https://www.facebook.com/spuriairissociety or you can find them at www.spuriairissociety.org. 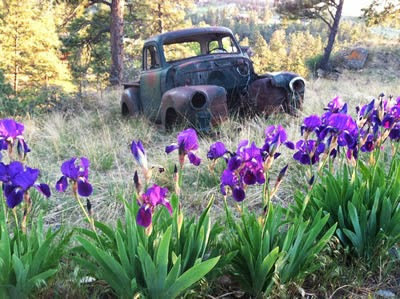 I'm planning on adding some spuria irises to my landscape this year, how about you? On a personal note: I didn't have the pleasure of meeting Kathie, who is an integral part of ZEBRA IRIS GARDENS. She recently had surgery for breast cancer, which will have to be aggressively treated. She will be having a mastectomy, with associated lymph node removal, followed by probable chemotherapy and radiation. I, along with so many others, wish Brad and Kathie all the best these next months as they deal with this new challenge, while keeping up with the rigors of their commercial iris business. 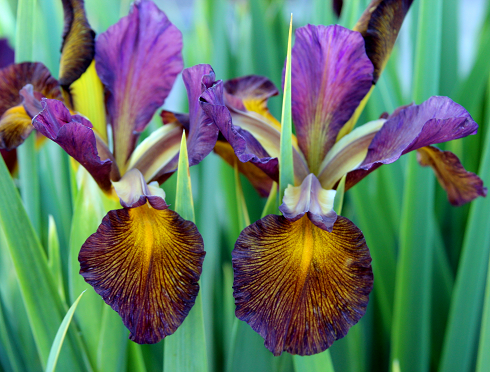 Louisiana Irises -- Who could possibly have one favorite? 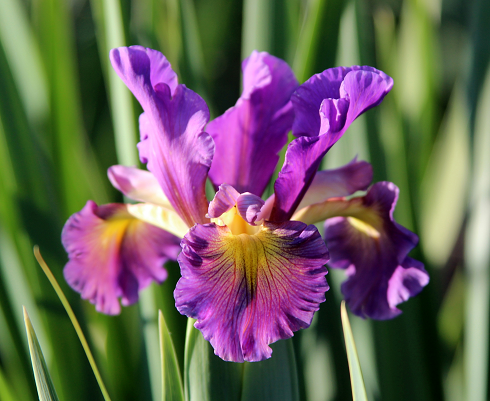 We grow a lot of Louisiana irises -- about 80,000 plants in all, and over 500 varieties. Iris lovers often ask me to name my favorite Louisiana iris, at which point I begin rattling off the names of 15 to 20 varieties. I really do not have an all time "favorite" but I will share some of those that are in my current "top 30" list. This iris was named for my mother's sister, my Aunt Adell, and is one of my favorite irises because of the name and because it is such a pretty lavender iris, with veining and ruffling. 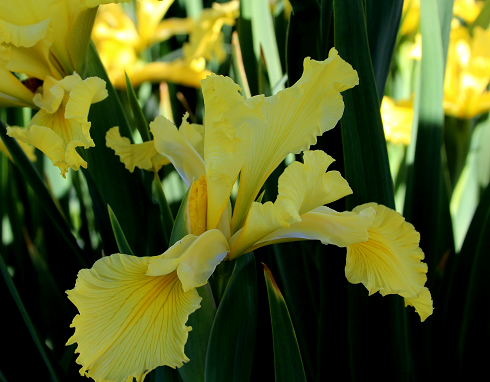 Charles Arny produced a lot of Louisiana irises in the 50's and 60's. 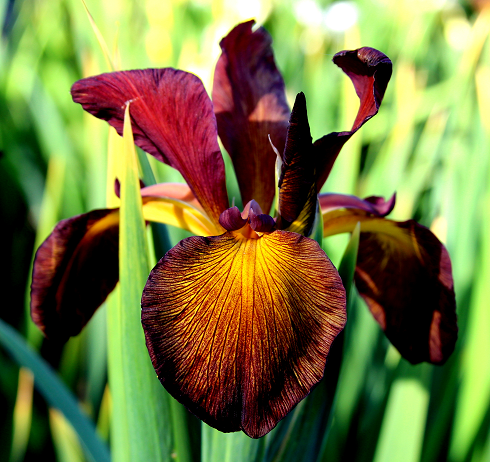 This iris is registered as "amber" but can look quite red at times. The darker style arms really set the flower apart from others. The Atchafalaya Basin in south Louisiana is well know for the bald cypress trees and "swamps" located within the basin. 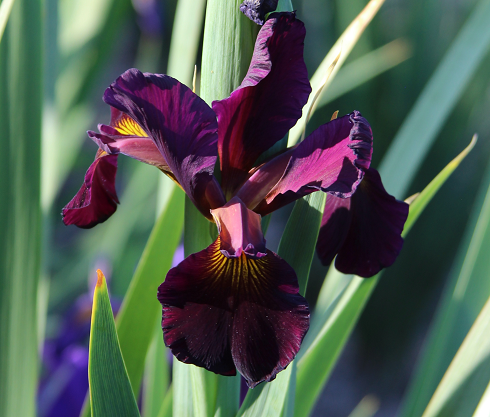 The iris is a beautiful open form dark red violet with a halo. 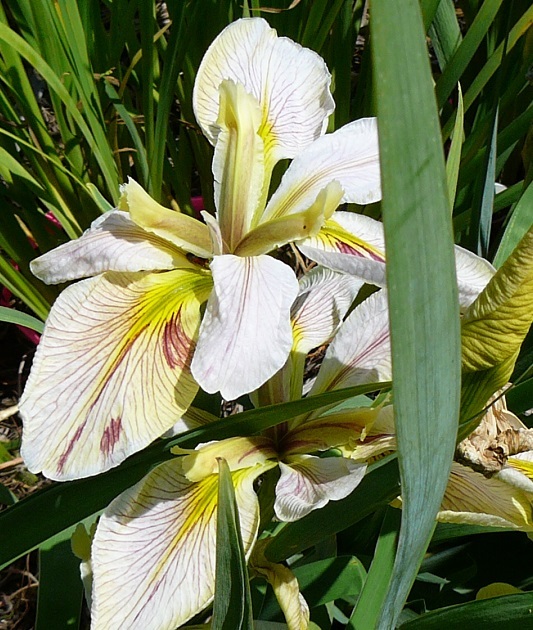 This large clump shows that it is a great garden iris. This iris is a great Louisiana iris. It has distinctive colors and has a great Louisiana name! 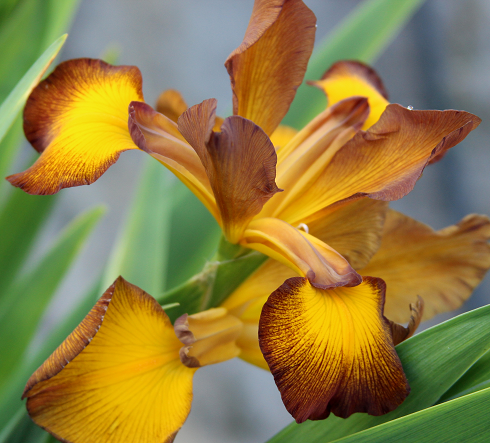 The "tiger" part of the name comes from the Louisiana State University (LSU) colors displayed by the flowers. Every Tiger fan should grow this iris. A beautiful bright yellow with orange signals. It is a great addition to any garden. Is it starting to show that I really like a lot of the older cultivars? This iris has flowers in the open form and is registered as "pale lavender" but looks more pink to me after it fades a little. The maroon surrounding the signal and showing on the style arms will help anyone identify this iris from a long distance. This iris out of Australia by Penny Davis is a beautiful wine "blush" or red sort of overlaid with orange, with ruffling and lots of other beautiful things happening in the blooms. It is in my top ten! 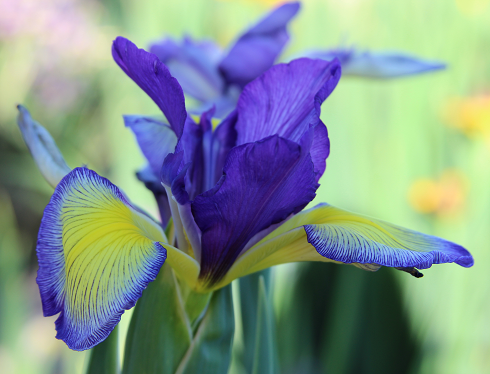 Of course this iris was named for Frank Chowning who gave us many wonderful Louisiana irises. 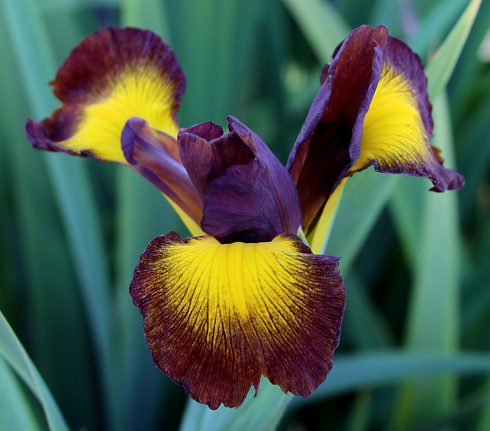 This iris is registered as "currant red" and has a nice bright yellow steeple signal with overlapping form flowers. 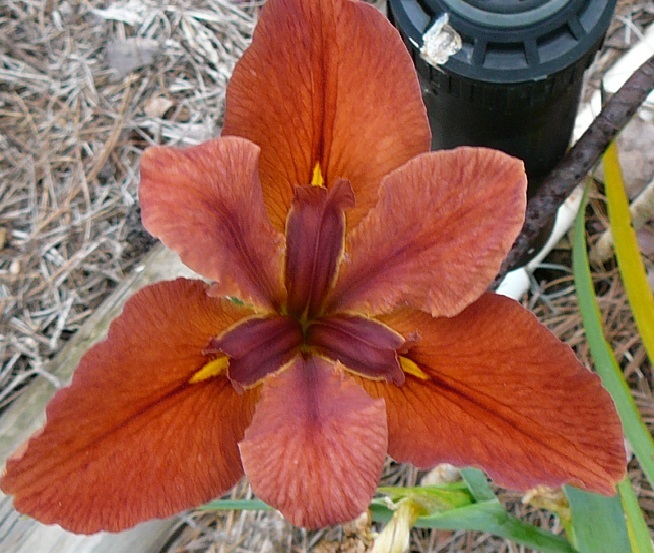 This "brick red" iris has a lot going on in the bloom. 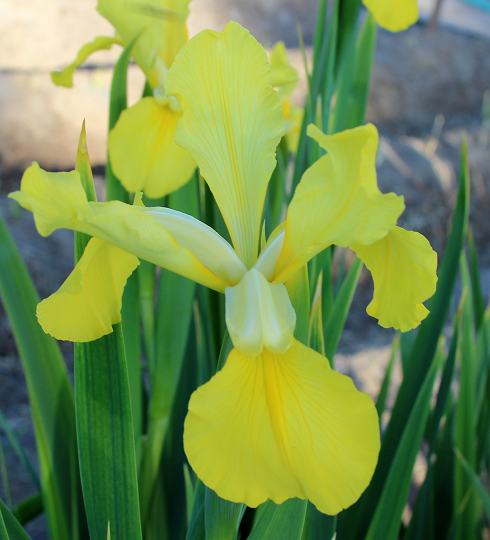 The spray pattern around the signal is a characteristic I like in several other irises. 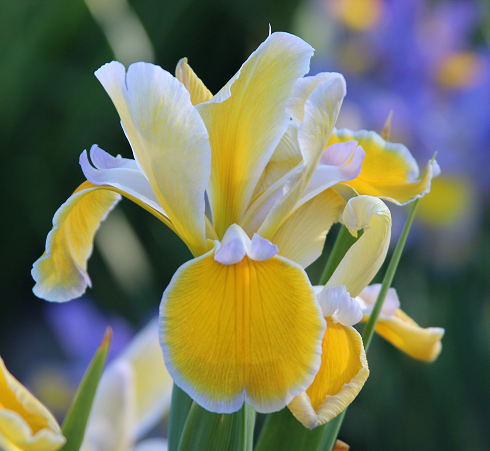 The style arms are edged yellow and there is a nice halo around the petals. A beauty to behold. Nice bluish stands with yellow green falls, green style arms -- even claims to have a slight fragrance. 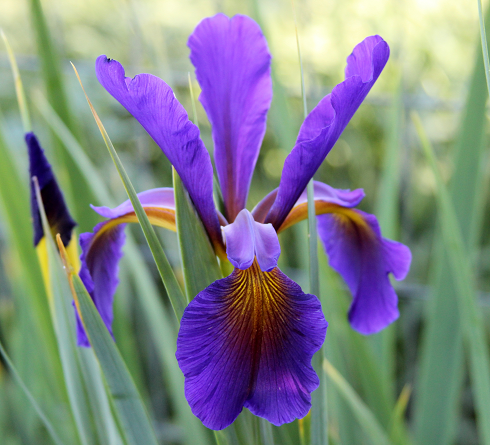 I love this iris and grow it in about 15 different locations! This iris has been around under the garden name "Plum Good" and was only recently registered. 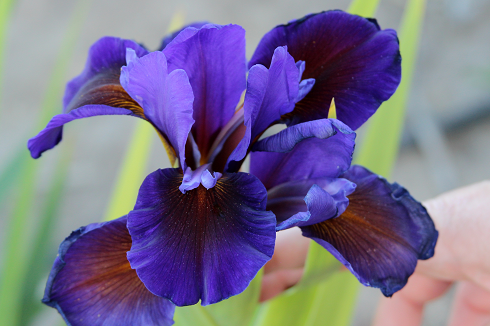 It is certainly "plum" colored and I think it is a very "good" iris -- you should be growing it! I know, I know! 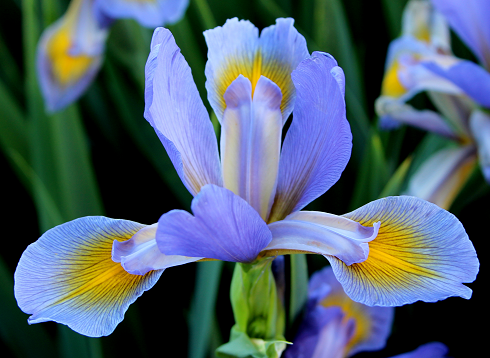 You can't pronounce the name of the iris nor the name of the hybridizer. Well, welcome to Louisiana. This iris is registered as "golden peach self" but looks more "orange" to me. 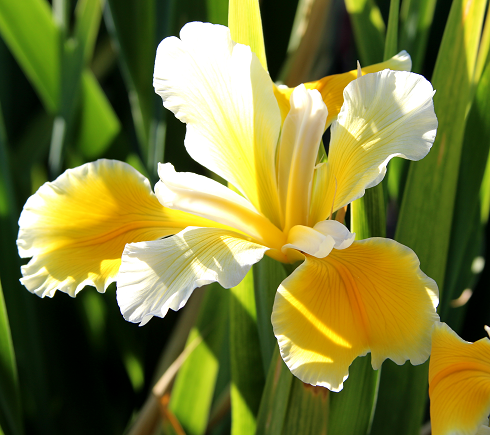 It has a distinctive signal and is a great garden iris. You can learn to pronounce the name or just give it a garden name of your own! By the way, Joe Musacchia lives SOUTH of New Orleans -- yes, south of New Orleans. I really love the iris and the name. 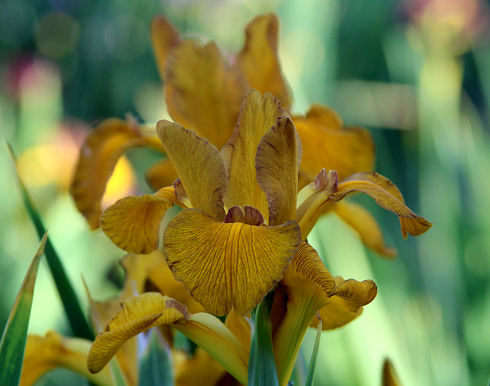 It is a great garden iris and grows like a weed here in NW Louisiana. It is registered as "rose pink" with lemon style arms. 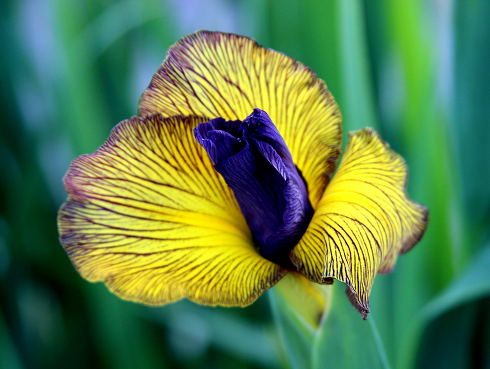 A great iris! 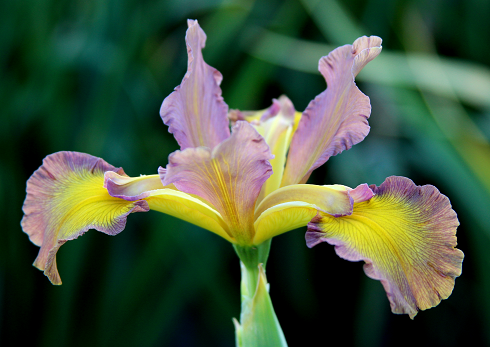 Another iris out of Australia that caused quite a stir when it was first introduced in the USofA. I had people calling me from Florida wanting to purchase it and I had never even heard of it! 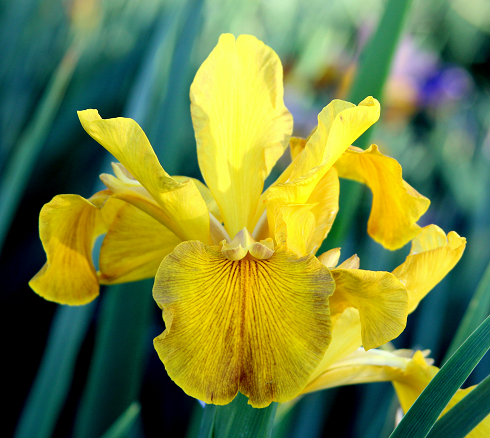 Now we grow it and it is certainly a "novelty" iris that will add excitement to your garden. The white "cartwheel form" iris in the front is Starlite Starbrite and the darker blue one in the back is the "cartwheel form" Delta Star. Marvin Granger produced quite a few of these "laid out flat" irises that have all falls and no stands. Starlite Starbrite is a show winner and has won many blue ribbons. 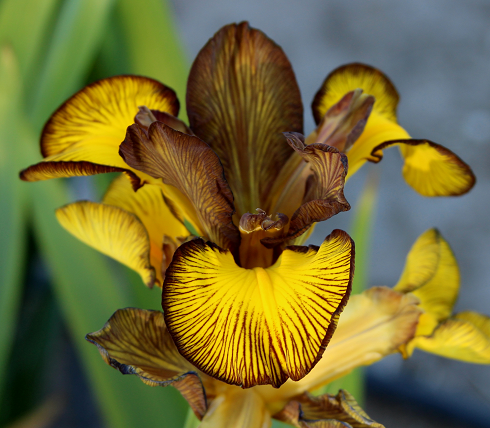 Mary Dunn lived in CA and hybridized many award winning irises. This light orchid colored iris has lighter stands and that wonderful darker veining from the signal down to the edge of the petals. Texas Toast is one of the most unusual tetraploids (having four times the haploid number of chromosomes in the cell nucleus- most Louisianas are diploid) of the few registered. It does in fact look like a nice lightly toasted bread. Joe Mertzweiller did a lot of work on converting diploids to tetraploids and this seedling was still around when he passed away. Marie Caillet registered it for him in 2005, long after his death. 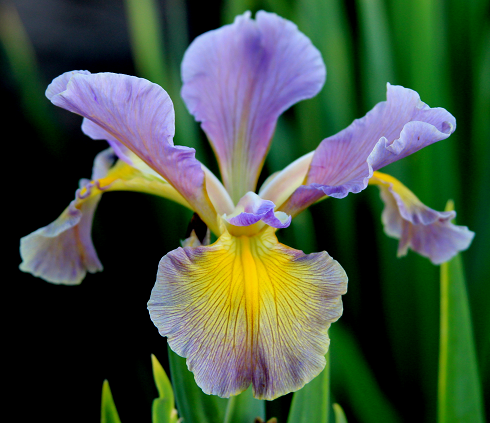 Most growers of Louisiana irises are familiar with Caroline Dormon but not all know that her sister Ruth also grew and hybridized Louisiana irises. This is a very late bloom with a white spray pattern around the signals. An oldie but a goodie! When you see a clump of this iris in full bloom you will indeed think you have wandered into a cotton field in Louisiana or Texas. The beautiful white blooms sure do look like cotton bolls. This iris is a beauty. It grows well and has very green style arms. The signal is surrounded by an orange red coloring. It is indeed "heavenly"! Professor Neil is one of the tetraploids hybridized by Professor Mertzweiller in the 50's and 60's. It is a great garden iris and my favorite of the "professors" (a group of tetraploid Louisiana irises named by Mertzweiller for his professor friends at the University of Louisiana at Lafayette). In the background is "Her Highness", a collected iris.giganticaerulea alba that is in my top ten! This iris is an eye catcher! The veining, the blue and yellow stands, the yellowish "ground" veined light blue falls, the green yellow signal! 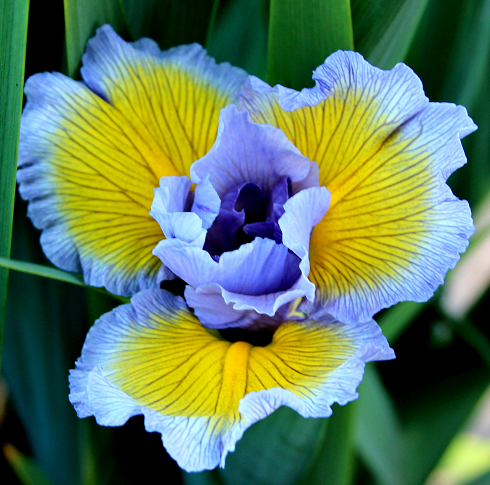 Wow, beautiful and a great garden iris. Farron Campbell once owned Lone Star Nursery in the great state of Texas. 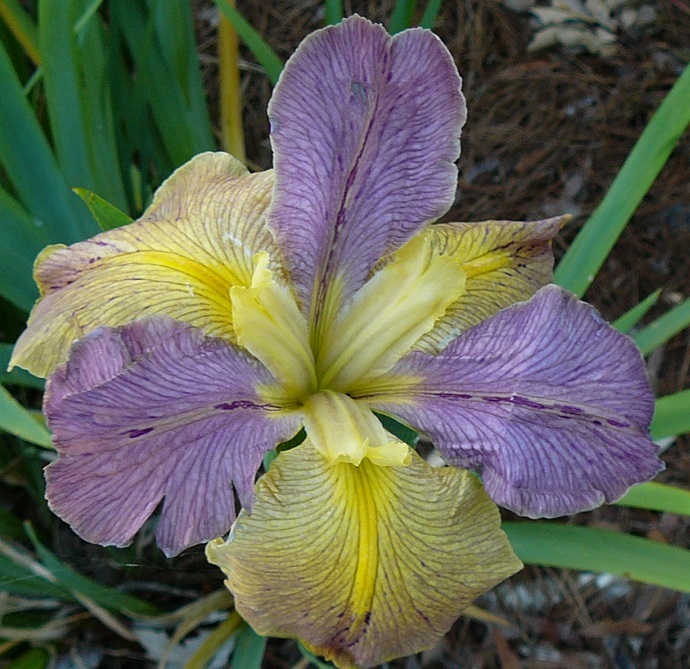 He hybridized this iris that has i.hexagona in its parentage. It is a very late bloomer and has a cartwheel form, laid out like a plate! Very pretty. 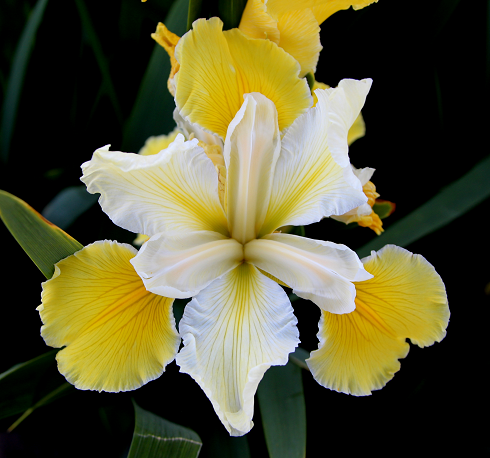 This beautiful white iris with "laced" edgings was named for Longue Vue House and Gardens in New Orleans, LA, where you can find many Louisiana irises growing along with thousands of other plants. My favorite white and among my all time top ten. A "sandy coral" iris with yellow gold signals and greenish style arms. Very distinctive and a great garden iris. A treasure from the great state of AZ. 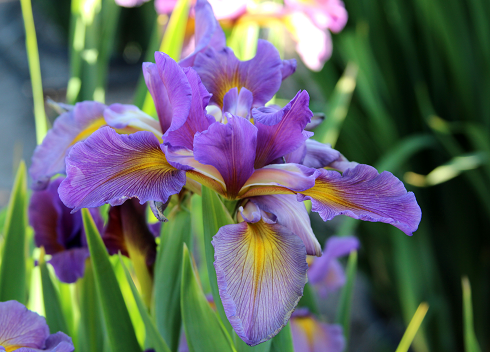 So, as you can see, I really like some of the older Louisiana irises, irises that are considered "historic" because of their age. 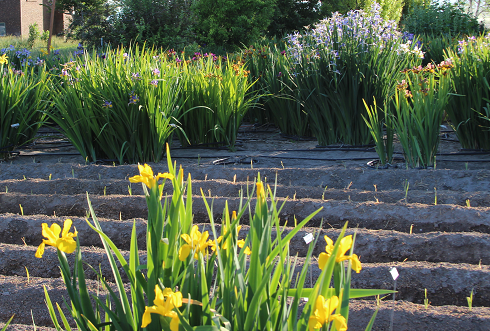 We still grow hundreds of irises registered in the period 1920 to 1960. I like the older open forms and the smaller blooms -- yet I also like the more modern fancy ones. I just love too many of them to chose one favorite. Do you have trouble winnowing down your list to one favorite? Tell us which ones you like and why in the comments section. 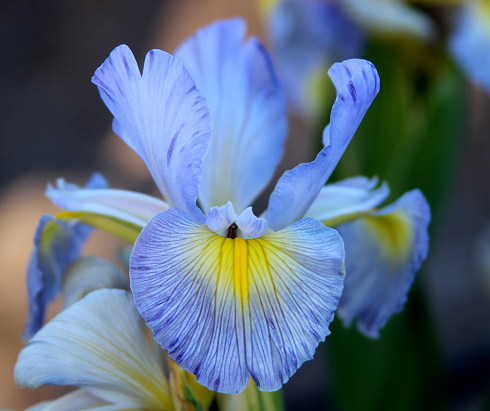 If you are interested in growing some of the beauties, contact the Society for Louisiana Irises for more information. 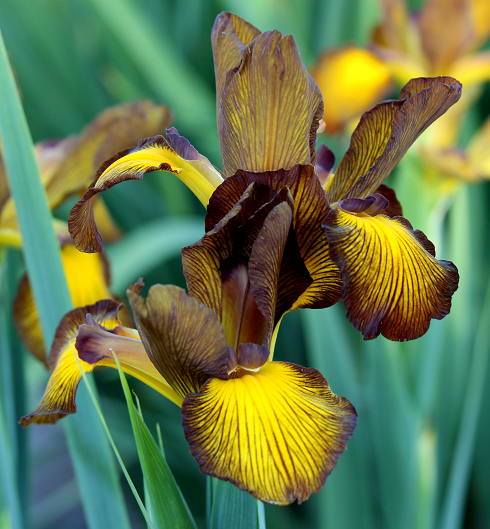 You can also learn a lot more about irises by visiting the American Iris Society web site.